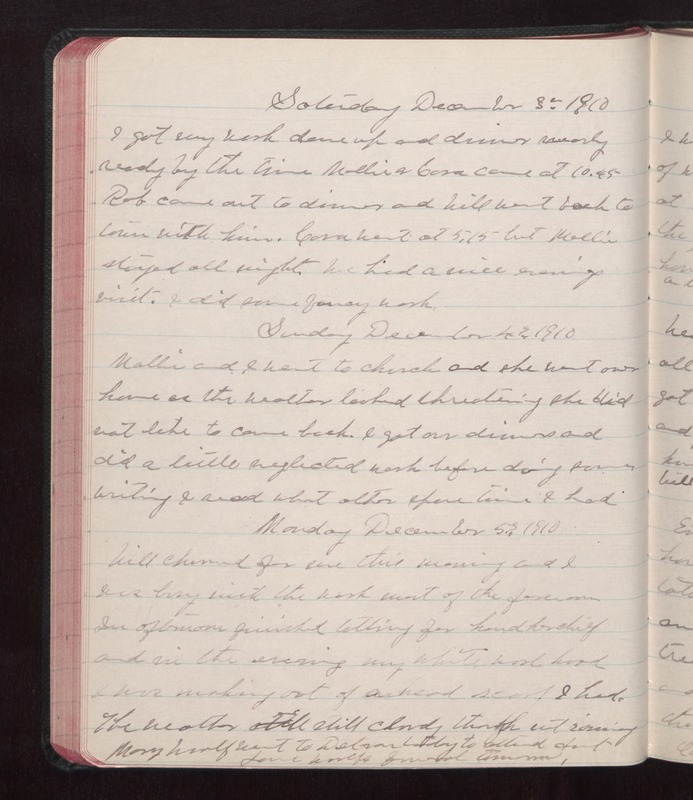 Saturday December 3 1910 I got my work done up and dinner nearly ready by the time Mollie & Cora came at 10.45 Rob came out to dinner and Will went back to town with him. Cora went at 5.15 but Mollie stayed all night. We had a nice evenings visit. I did some fancy work. Sunday December 4 1910 Mollie and I went to church and sent went over home as the weather looked threatening she did not like to come back. I got our dinners and did a little neglected work before doing some writing I read what other spare time I had. Monday December 5 1910 Will churned for me this morning and I was busy with the work most of the forenoon In afternoon finished tatting for handkerchief and in the evening my white wool hood I was making out of [a head?] scarf I had. The weather still cloudy though not raining Mary Woolf went to [Delmar?] today to attend Aunt Jane Woolfs funeral tomorrow.